This is where I finally figure out where the five gallon mark is on my 5 gallon carboy. I have had my carboy since the mid-nineties, and it’s an older version made in Mexico. I have never checked it, so I decided it was about time to determine where that mark is. I also want to determine how much extra head space, after five gallons, I have left in my carboy. Using some basic stuff like a bottling bucket of water, a flashlight, and marker I determine my level and learn that I can fit about five and a half gallons inside. Fill up your bottling bucket with five gallons of water. Using a funnel in your carboy, start slowly pouring the water inside until your bucket is empty. Then, mark the five gallon water line. Mine is just below the top ridge on the carboy. To figure out how much more you can fit inside, fill up your bucket with one more gallon and slowly repeat the process, careful not to overflow your carboy. 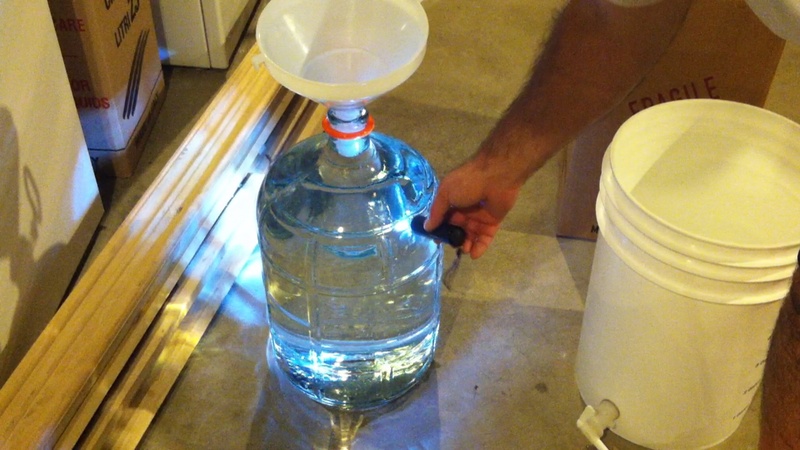 Using a flashlight, check your water levels in the bucket once the carboy is filled to capacity. Mine fit another half gallon, leaving me with a total capacity of five and a half gallons. This really isn’t all that exciting or complicated, but accurate volume calculations are required in BIAB brewing and homebrewing in general.